A 22-year-old man has died after he was hit by a tram in Sheffield. Matthew Lydon, from Derbyshire, was lying on the tracks when he was struck by the Supertram at 2345 GMT on Friday. He suffered serious head injuries and was pronounced dead at the scene. The accident happened on a bridge above Park Square in Sheffield city centre as the tram left Commercial Street on its way back to the depot. A spokesman for South Yorkshire Police said: "The driver saw something lying in the tracks and applied the emergency breaks but was unable to stop in time." 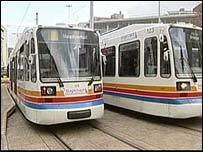 Supertram services have now returned to normal.